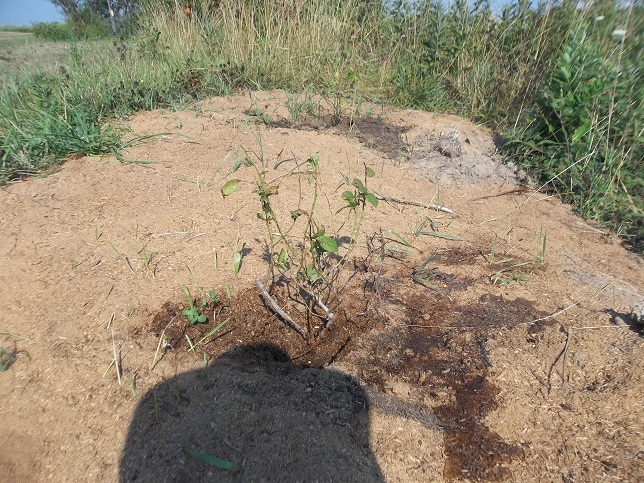 In working to establish tree guilds around the dwarf apple trees I planted I ordered goumi. Near as I can tell it’s pronounced gwammee, not gummy. The book Gaia’s Garden lists plants appropriate to an apple tree guild. The guild includes bee balm, comfrey, daffodils and a few others but let’s just start with what we have. I have apple trees already. Thanks to Sandusky Valley I now have goumi. They don’t look like much now but they should take off in the spring. 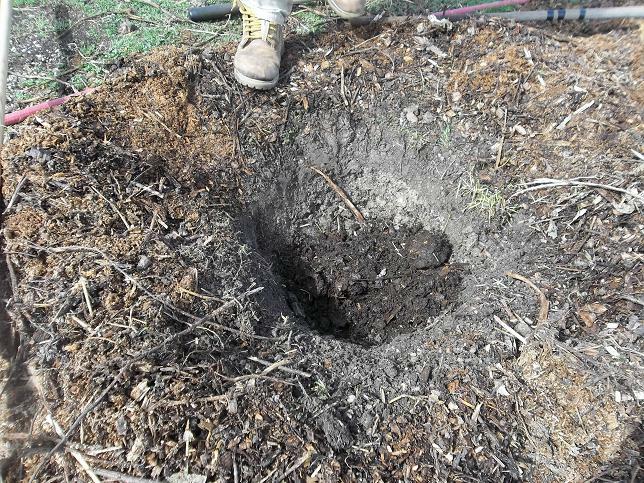 Toby Hemenway suggests you fit Goumi anywhere you can to help establish new trees and boost production. The idea is that goumi (a nitrogen-fixing plant) grown next to and in proximity of trees will provide nourishment to the trees. He even suggests you plant your apple and goumi in the same hole, cutting the goumi back each year to half the tree size. Goumi is propagated by cutting. The cuttings I got were bare-root and well rooted. 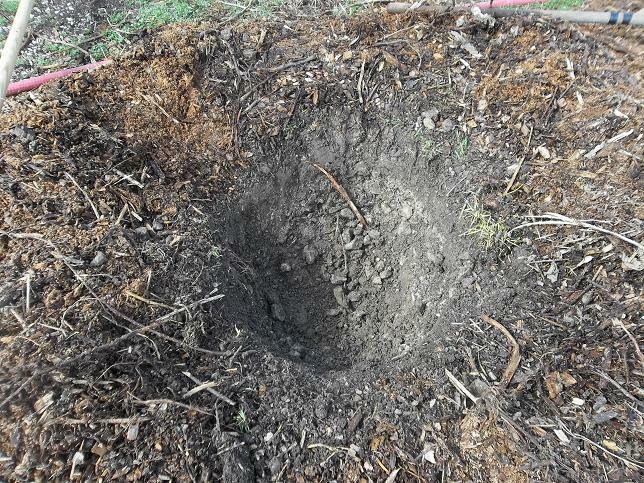 I made a mix of well-composted horse manure, sawdust, perlite and a greensand and planted the goumi at even spaces between the apple trees. 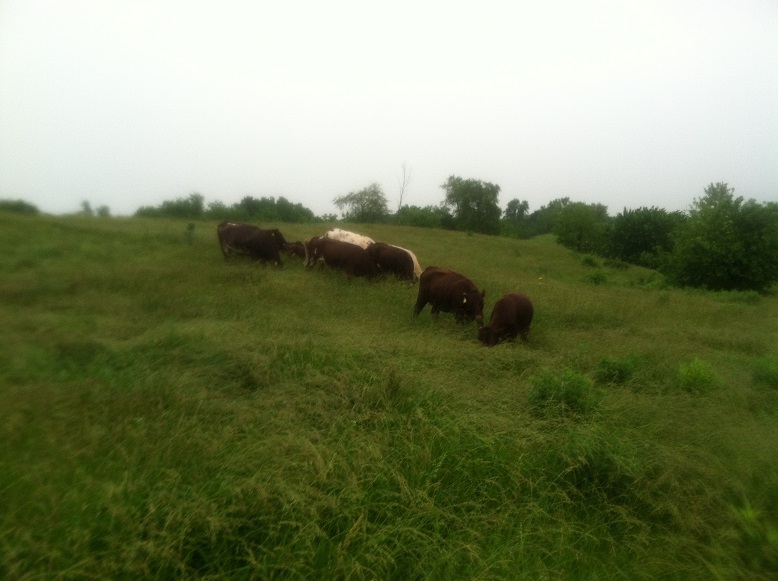 The trees are planted 8′ apart so I planted 2 goumi in a line at the 4′ mark. This should keep the plants in sufficient sunlight as the guild develops. Let me know if you have any experience with goumi or recipies you can share. 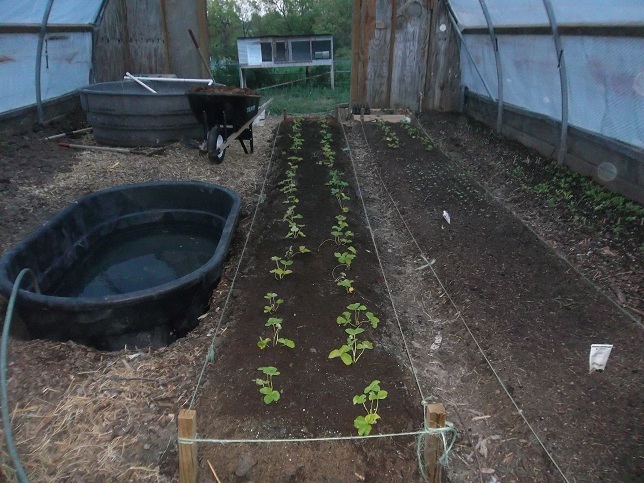 Well, we have this greenhouse…thing…and we’re trying to find ways to put it to use. So…we’re shootin’ for early season strawberries. I bought 50 Chandler plants from Ison’s nursery in Georgia. 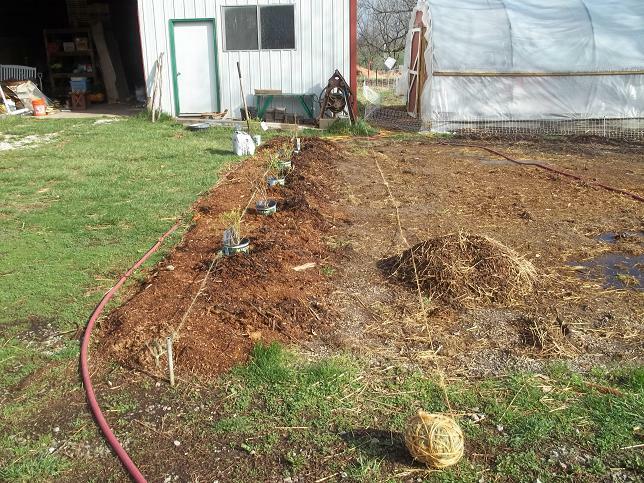 I marked out another garden row, put down a layer of composted mulch then started digging the hole for the next project, aquaponics. More on that another time. I needed to do something with the blue clay I was digging out of the hole so I put down a layer on the strawberry row. Then I added a layer of composted horse manure and sawdust, jersey green sand and just a bit of aragonite before going to work this morning. Then the oldest boy and I popped them in the rows when I got home. Our rows could be straighter but what’s the fun in that? Plants are 1 foot apart in rows and the rows are a staggered foot apart. I am loosely following the Missouri high tunnel production plan but I emphasize the word “loosely”. OK. Well. Too much to do to sit around chatting. Hope this works. It could be a spectacular failure. Well, it could be a failure. It’s not big enough to be spectacular. Anybody have any tips for me? I found these poor little things on sale for $2.50. Normally I’m not one to bring home sick, helpless little things but I like blueberries, have a pallet of peat and am willing to try. The retailer had just about given up on them. 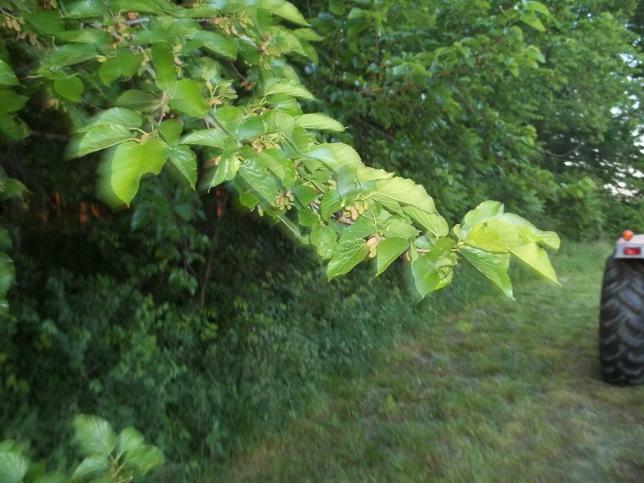 I found 9 that still had green leaves. I brought them home, filled the pots to the top with peat and gave them a good soaking in a bucket. 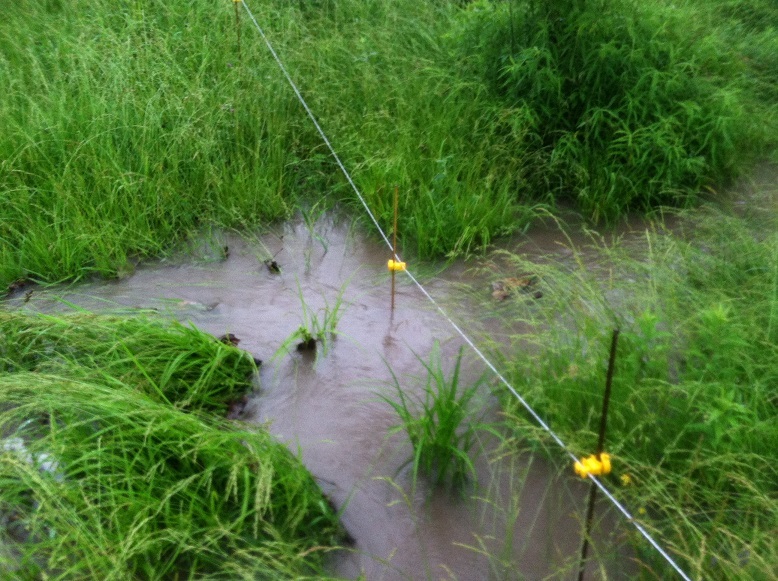 Each day since then I have soaked them in about 2″ of water in a bucket until the peat is saturated. Then they sit in partial sun all day. We’ll see what happens. I may have wasted $20. I don’t really think so though. What about you? Is there something you just can’t pass up when you see it on sale? Do you believe you have the touch to bring things back to life or are you at least willing to try? Have any tips that would help me out? 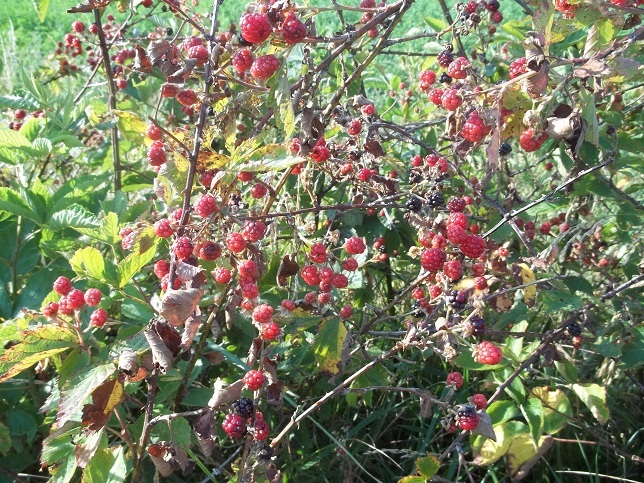 We have been picking dewberries for days now. They are not quite the same as raspberries. Aunt Marion set me straight on which berry is which. I keep a volunteer patch near the beach at the pond. 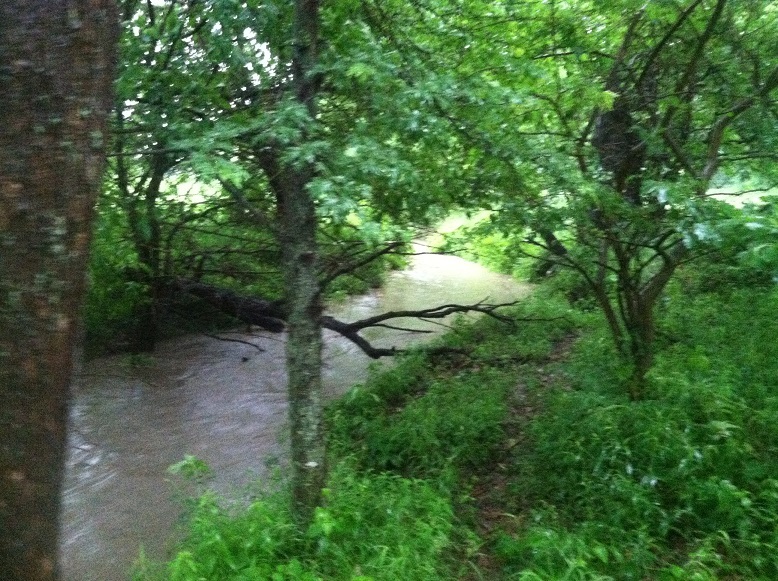 Apparently I keep poison ivy there too. 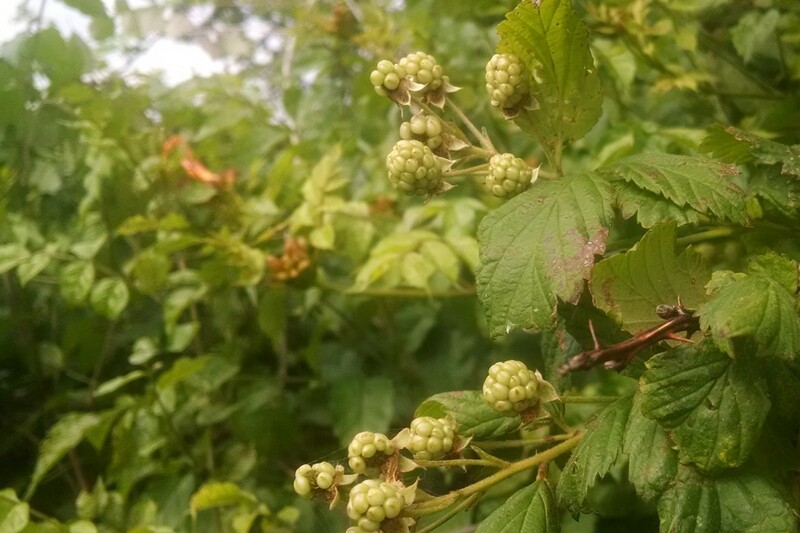 We are beginning to cultivate this volunteer stand…meaning I mowed through the middle of them last fall separating the brambles so we could really get in there. This year I’ll mulch them and yank the poison ivy. Pretty good picking for so little rain. 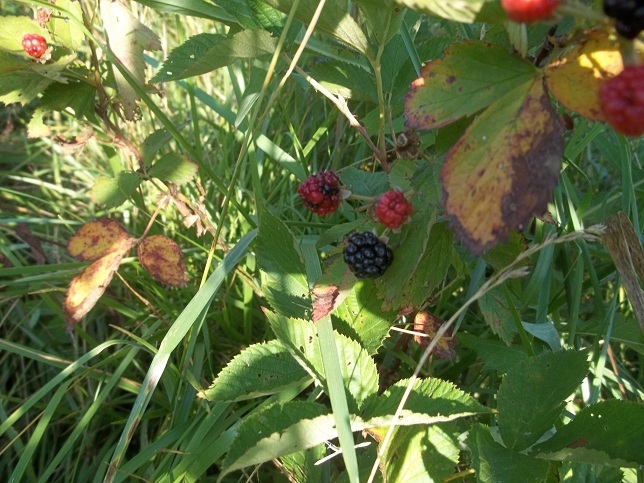 You know the best part of picking berries? Eating them. Most of our berries go to the freezer for later though. We get about a quart a day which we promptly wash, spread on a cookie sheet and freeze. Then we use a spatula to pry them up and pop them into a freezer bag and use them later for smoothies or forget them till spring and mix them 50/50 with strawberries in jam. 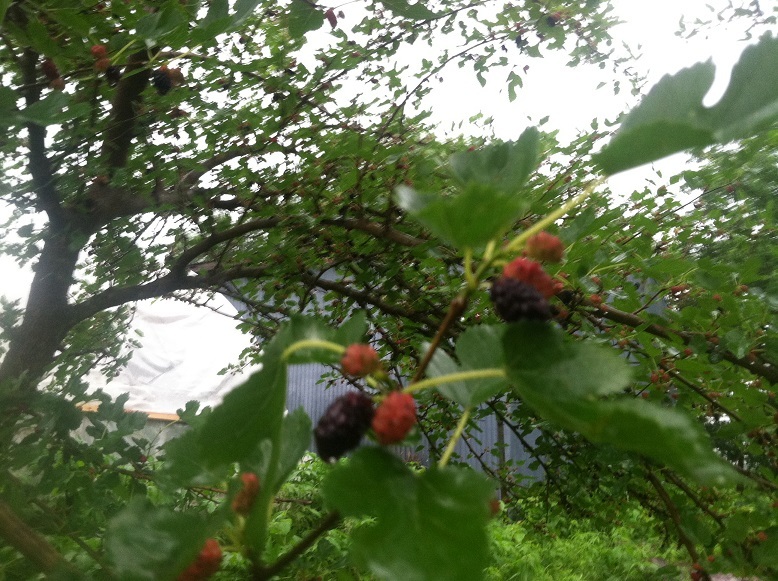 Maybe toss in a couple of mulberries too. Mmmmm. 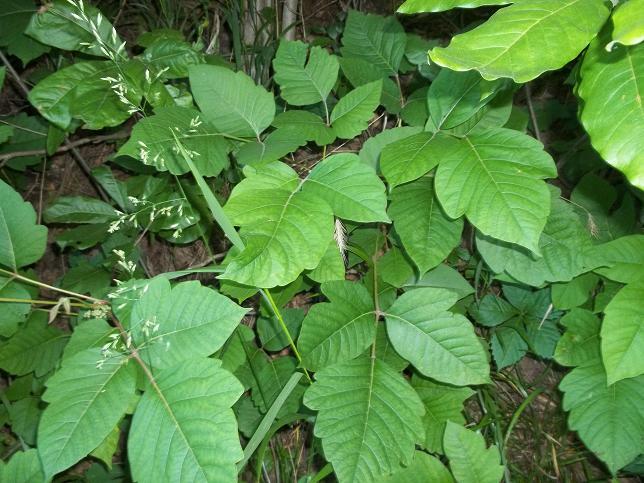 So, trying to put a positive spin on everything, you know the best part of poison ivy? Hot water. It feels great. 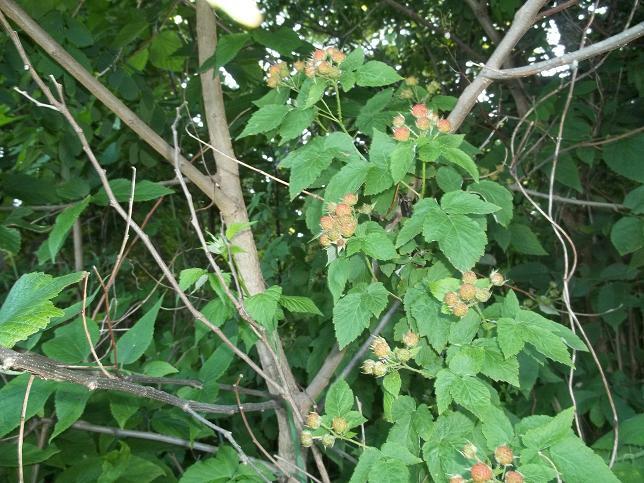 Soon the poison ivy will clear up and we’ll be left to enjoy the fruits of our labor. 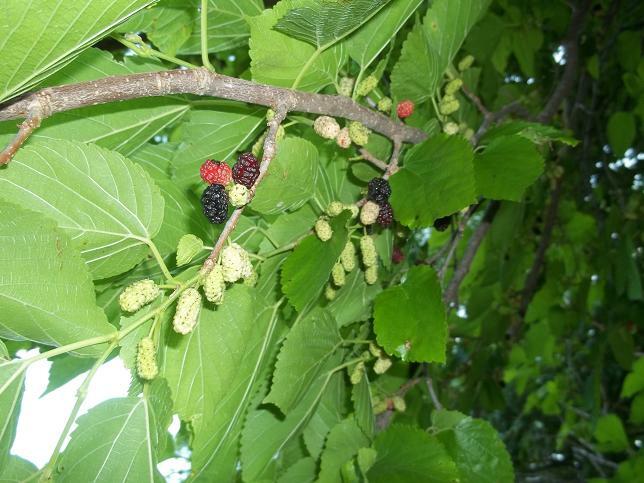 Do you have mulberries where you live? Do you even notice them? We have them here. When I was a kid in New Minden we had one in our back yard next to the gate that led to the alley and Mrs. Ruth’s yard. There was a crotch in the tree just right for a 7 year old to park in and make himself sick eating berries. I did. 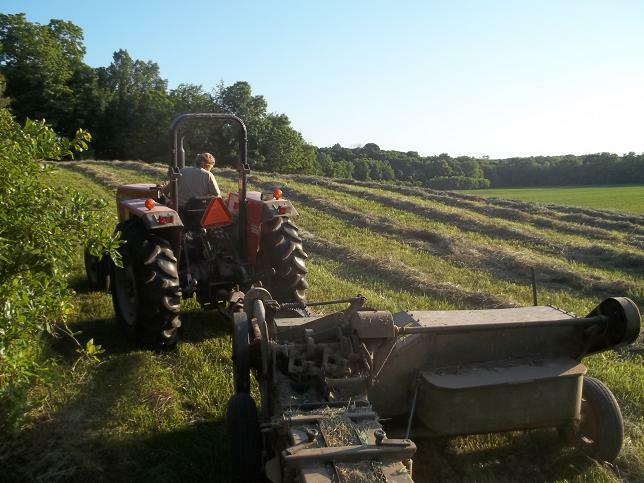 Today we baled hay in the bottom where mulberry trees abound. I picked a handful while I was walking out to where dad was ready to bale. 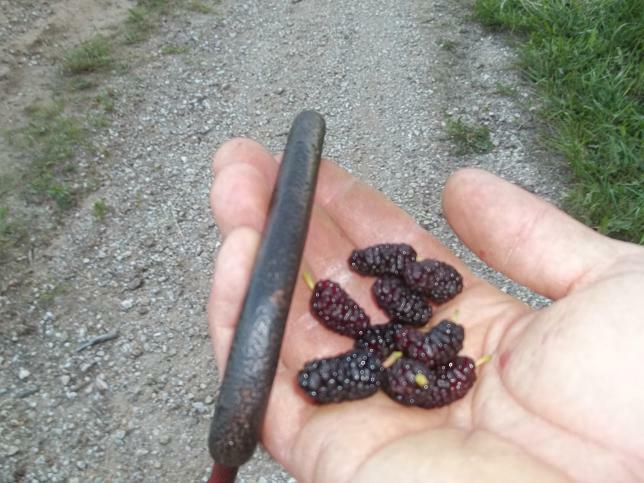 I picked another handful when the baler went under a mulberry tree. I picked yet another handful for good measure. Don’t mind the hay hook. 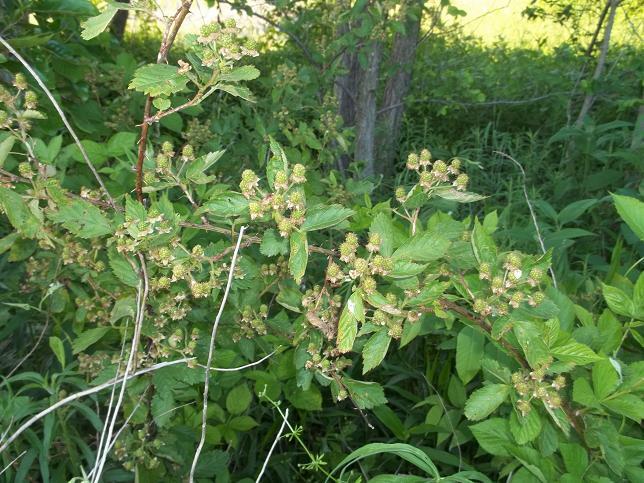 We pick and freeze as many as we can get my hands on but we really don’t go past the edge of the woods because there’s a bumper crop of poison ivy out there every year. This year is no exception. Each spring we clean out our freezer and find forgotten gallon bags of berries and make a big batch of mulberry, dewberry, blackberry, strawberry mixed jam. Yeah. It’s pretty good…better on ice cream. So anyway, we were out there to make hay. I’m a little allergic to hay. On the third pass I started sneezing. By the fourth pass my hankie was soaked. Dad runs the baler clockwise around the hayfield. Both of dad’s main fields are on a slope so it’s an interesting ride. Between the two fields in the bottom and the barn lot we put up another three wagons of hay. 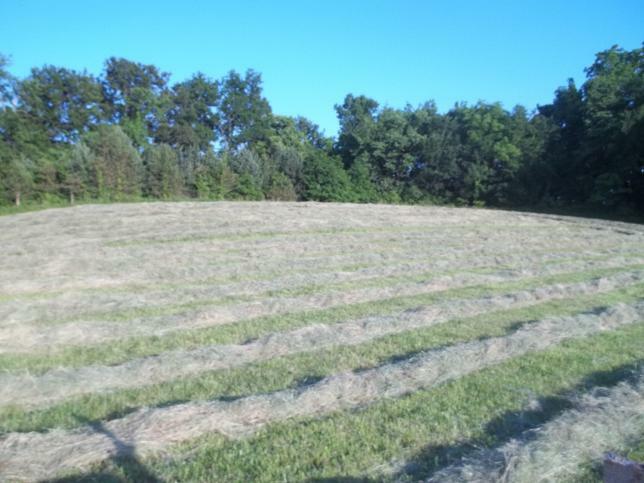 We have had an unusually dry spell so this is far and away the best first-cutting hay we have put up in years. Isn’t it pretty laying in windrows? That hill made about 65 bales. For years we have purchased blueberries from some friends, Mark and Kelly Smith. This year we thought we should put in a row of our own and see how it goes. With luck and in time we may be blueberry independent. We had 2 inches of rain the night before so working on mulch was going to be the only work I could accomplish in the morning. Now, I know blueberries in central Illinois may not qualify as sustainable as our soil is anything but acidic. They are something of a guilty pleasure. I’ll have to work to keep the acidity up. 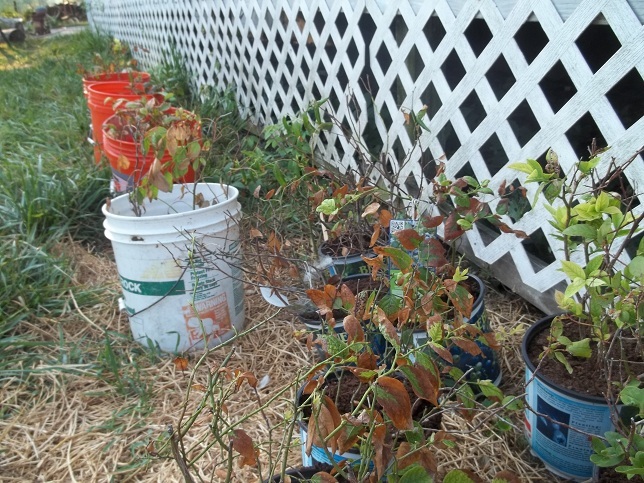 But we like them, they will provide a little color in the fall, and a windbreak for our garden. Also, the line we are planting is at the very edge of the parking lot/driveway and will give us a clear border. I began by laying out some lines that were square with the buildings. Please note the recycled bailer twine. 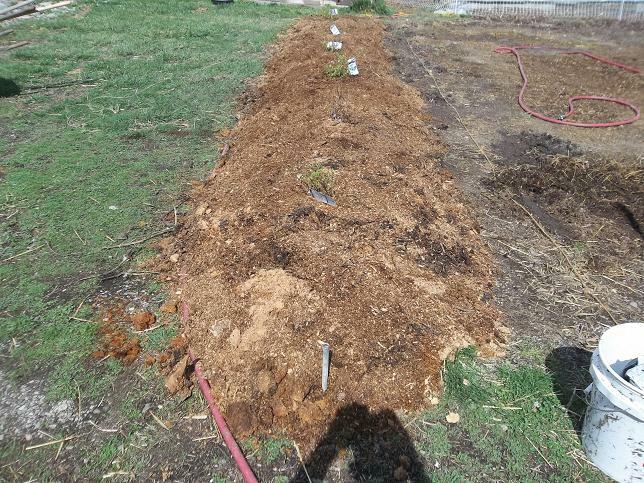 I also had a 6″ deep line of aged wood chips and sawdust in place for the last week or so in preparation for planting. 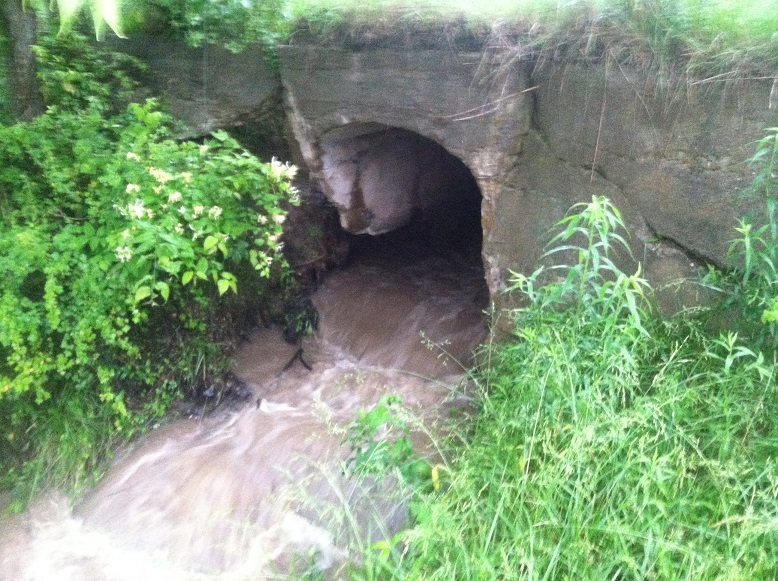 Then I began digging. I knew my grandpa collected rocks but I had no idea. I plan to put up a post in the near future about making sure your short-term goals (preventing your tractor from getting stuck) won’t be in the way of future generations…considering the consequences of your vision. 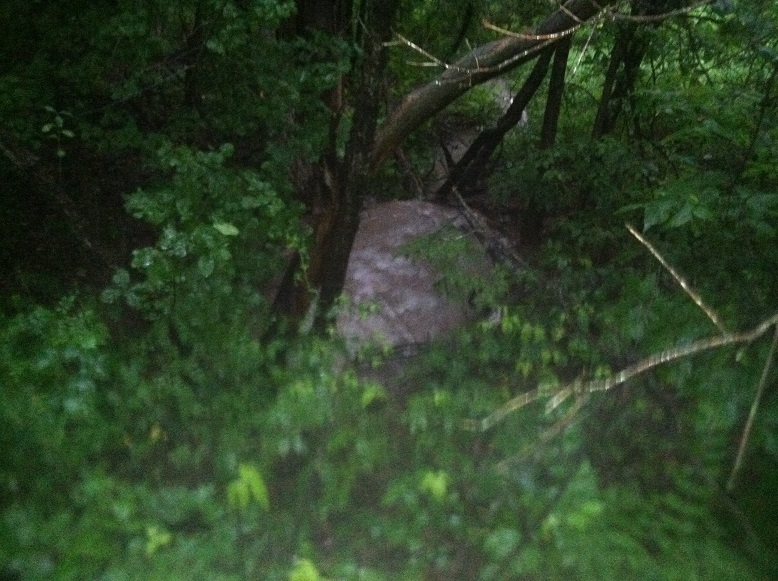 The goal is to dig a hole 1 foot deep and 2.5 feet in diameter. I stopped mining rock before I got to my goal on the last hole..
Because I took so much rock out I had very little soil to put back into the hole. I put in a mix of several things to give my plants a good start. 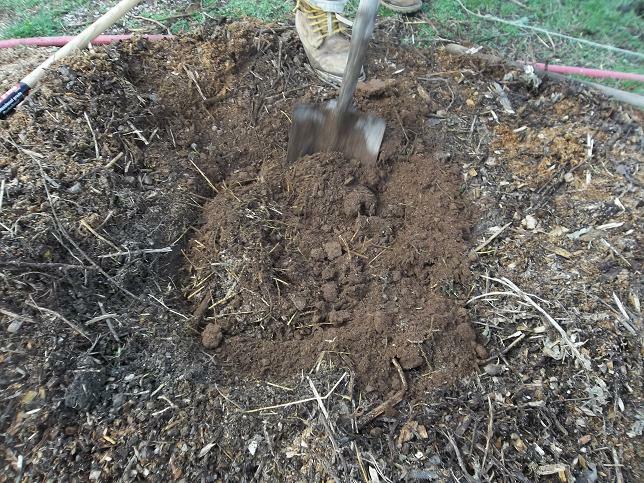 First I put in a few shovels full of unsifted compost. Then I added in about half a bag of peat to bring up the acidity. Now, if given the choice between peat and coco coir I would choose the coco coir but this is a special situation. I bought a greenhouse from a nursery that was going out of business. He also had a pallet of peat. Rather than send the peat to the landfill I brought it home. This isn’t a choice I make every day but I think, in this scenario, you understand. Next I add a few shovels of rabbit manure mixed with sawdust. 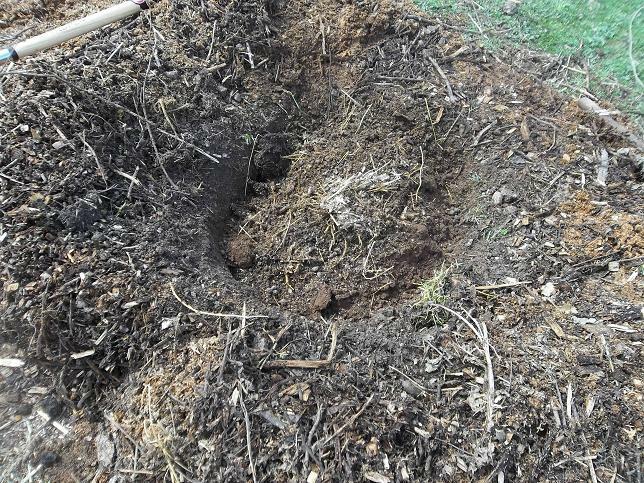 I realize not everybody has rabbit manure but you have to understand, I don’t have soil in this hole. 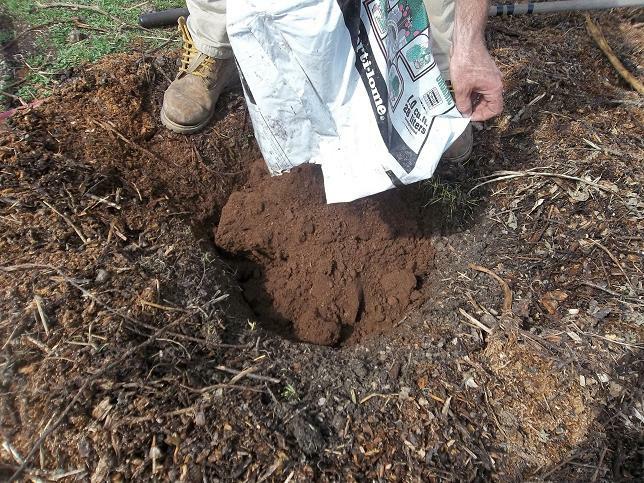 I’m using the rabbit manure to replace the missing soil mass. Bear with me here. I’m not presenting an ultimate solution, I’m just trying to make lemonade. Then I mix the components and add some water. Now I replace my string, measure my space between plants (with a 4′ tool handle) and place my plant in the hole. 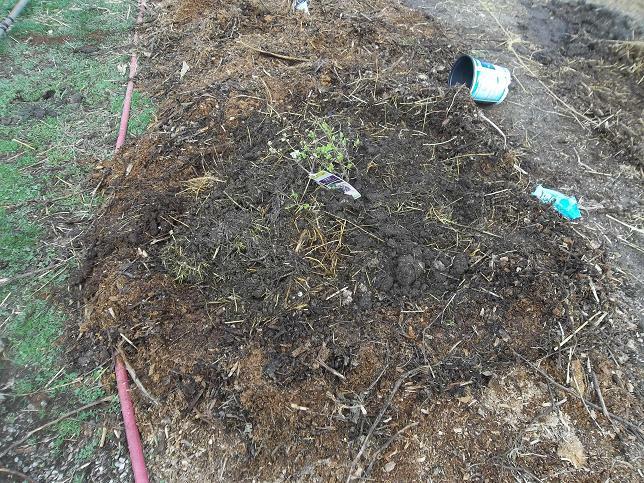 I’m still short on soil so I continue surrounding the plant with rabbit manure and top it all off with a bit of horse manure. Yeah, I know…not everybody has horse manure laying around either. I’m trying to bring up the acidity after mining out a bushel basket of limestone. 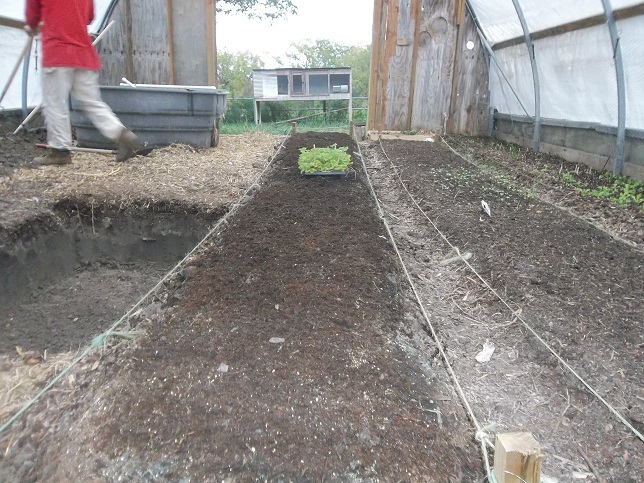 Finally, I cover the row with a fresh 4″ of composted sawdust. As that sawdust breaks down it will provide a weed barrier and raise the acidity of my soil. 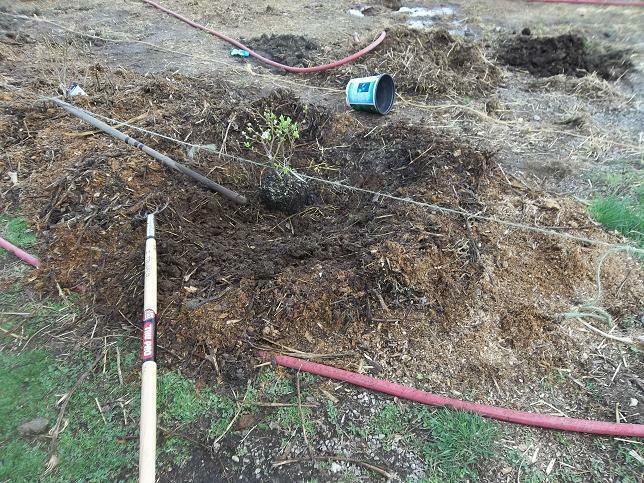 Also it will sponge up moisture and provide soil structure as blueberries want to be moist, not wet. I have done a lot of work over a couple of hours to plant a measly six plants. As they grow they’ll tell me what they need. I may have to make some changes or at least a few tweaks before they really take off. I don’t know. It is the unknown unknowns (Thanks Talib) that make gardening exciting.